In Africa and Asia, elephant habitat is being replaced by agriculture - both by small-scale farmers and international agribusiness such as palm oil. Elephants are not only being squeezed into smaller and smaller areas, but farmers plant crops that elephants like to eat. As a result, elephants frequently raid and destroy crops. They can be very dangerous too. While many people in the West regard elephants with affection and admiration, the animals often inspire fear and anger in those who share their land. Elephants eat up to 450kg of food per day. They are messy eaters, uprooting and scattering as much as is eaten. A single elephant makes light work of a hectare of crops in a very short time. Small farmers - often desperately poor and already economically and nutritionally vulnerable, forced by circumstances to encroach into elephant habitat - can lose their entire livelihood overnight from an elephant raid. Large agriculture is also affected. In the largest palm oil producing province in Indonesia, Riau, losses due to elephant damage of oil palm plantations and timber estates are estimated to be around US$105 million per year. People are also often injured and killed. In India, over 100 people are killed by elephants each year, and over 200 people have been killed in Kenya over the last 7 years. Elephants are often killed in retaliation. Wildlife authorities in Kenya shoot between 50 and 120 problem elephants each year and dozens of elephants are poisoned each year in oil palm plantations in Indonesia. Over the last 100 years, African elephant populations have declined from 3-5 million to 470,000-690,000 and Asian elephant populations have declined from 100,000 to between 35,000 and 50,000. Habitat loss and conflict with people are among the biggest threats to their continued survival. WWF and its partners are working to reduce conflict with elephants through a range of techniques. These include: chilli and tobacco-based deterrents to keep elephants out of fields; changing farming practices - making farms easier to defend; growing crops that elephants don't like; education; and improving oil palm plantation practices in Malaysia and Indonesia. One example involves restoring degraded biological corridors to facilitate seasonal movement of elephants and other wildlife in the lowland Terai region of Nepal so that the animals don't need to travel through human habitations and habitat management in protected areas in Nepal. 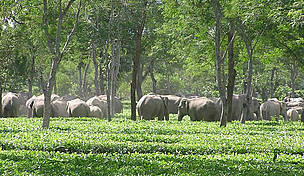 A large herd of elephants takes refuge in a tea estate in Assam, a favorite shelter for elephants lacking forest cover. Is your ice cream bad for elephants?